"We'rehappy, because we made minor changes to the car that improved it in both races. "Inthe last race, the Altima was probably the best it has been all weekend. I wasquite happy with the way it was handling through the corners. We still have alittle way to go to get it handle as good in a straight-line, but to get somereasonable points, I'm pretty happy. 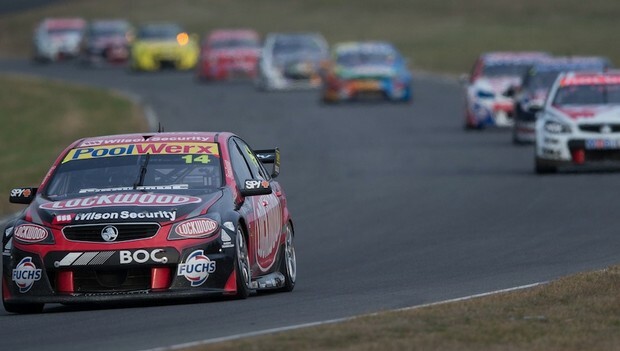 "Ifeel bad for turning around my old team-mate (Dean Fiore) on the front straightafter the final Safety Car. It was my mistake and I feel bad for that." “The whole aim coming to Tassie was to try and get through with straight cars ready to go to New Zealand. We knew it was going to be a struggle and we had to just get as many points as we possibly could. “To be honest I would have loved to have finished Race 3a and 3b a little bit better and obviously the first one today a little bit better, but the 16th we got in Race 5 was, as bad as it is for us, a really good result. “The guys did a great job, made a couple of small changes in between the two races that really sharpened the car up, so I think we should all be pretty happy. For the Nissan’s 15th, 16th and 17th is great, but on the Jack Daniel’s side it’s disappointing to see another issue with Todd’s car and not have him up there. "It was a tough day, but we knew that we would have a hard time down here. "This event gave us a great chance to focus on our chassis as we wait for some more horsepower to come, and the team are working really hard back in the factory to make that happen as soon as possible. "We tried a lot of things. Some good, some bad, and I guess out of that, we're learning a lot with a car that is only three events old. "When you're running near the back, you say to yourself "I'm glad we haven't got a crashed car" considering some of the stuff that we saw for other drivers. We've come away with four straight cars, and I think the team did a very good job considering the uphill battle we're fighting." “I am absolutely ecstatic with Lee’s result (13), it has been nice to have other team owners in the last few minutes say it was good to see us ‘race’ so soon. So it’s nice the category is already seeing us at that level. “To be able to run and compete mid-pack probably exceeded my expectations for this short track event and to produce the result they have is probably also a little premature for what I expected, none the less we came here to race and we’ll take it. “Lee and Tim (Slade) both did an outstanding job in that last race, on a whole I’m really humbled with the teams result as all three drivers managed to move forward in the races. This round we managed our way through a number of technical components relating to our performance and we wanted to run cleanly as a primary focus. “We ticked those boxes and the cars are basically straight unlike some other cars out there, so we don’t have that negative within the next few days of extensive repair work. “It’s really rewarding at this early stage to put cars out there that can race and we can fine tune within the competitive envelope. We are successfully moving out of the build phase and into the development phase as expected which is nice.